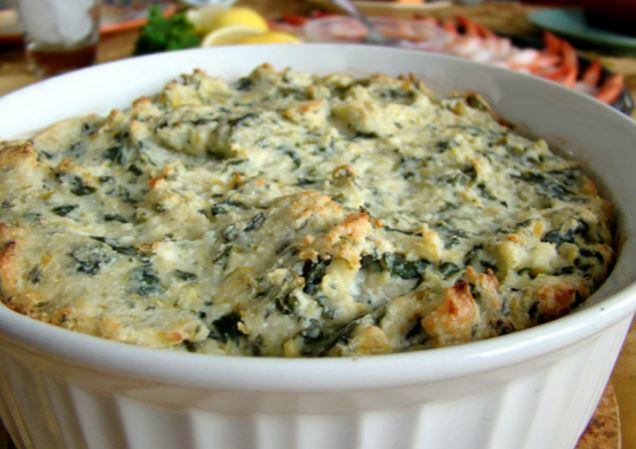 There are many different recipes for baked spinach and artichoke dip. It appears that everyone has their own personal favorite way of preparing it. When the spinach is growing strong at The Farm at Rockledge Gardens, it’s time to get that stuff wilted and wrapped in cheese with artichokes, don’t you think! This is one of the most popular American dips that we know and you will often find it on menus all across America and adorning the buffet table at countless different occasions. 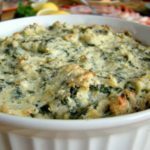 We love baked spinach and artichoke dip just as it is but think that it would be just as tasty poured over pasta or baked with any of the short pastas like penne, rigatoni or macaroni. Place the spinach leaves in a microwave safe bowl, and cook on high for 1 minute or until wilted. Drain the leaves and press them between paper towels, then chop roughly. Melt the butter in a nonstick frying pan over a medium to high heat. Add the cream cheese and garlic then cook for 3 – 4 minutes stirring constantly until the cream cheese melts to a sauce. Fold in the spinach, artichokes, sour cream and half of the mozzarella and half of the pecorino. Continue cooking and stirring until the cheese melts. Transfer the mix to a 1 quart shallow baking dish. Sprinkle with the remaining cheese and bake for 15 minutes or until it begins to bubble.